Welcome to the 4 star camping Yelloh Village Château la Forêt, in Saint-Julien-des-Landes in the Vendée. This 50 hectare estate, situated just 12km from the seaside, is ready and waiting to welcome you. On-site come and discover its aquatic area with covered heated swimming pool, paddling pool, waterslides and outdoor swimming pool (unheated) for adults with view towards the château, plus the many services available such as the bar and restaurant. The campsite offers entertainment during the season. Here at Yelloh Village Château la Forêt, we’ve thought of everything. In the heart of the Vendée, in the middle of the countryside, an hour's drive from Puy du Fou. The perfect location for nature lovers and for those who enjoy tranquillity, peace and serenity. Original activities: paintball, adventure courses. Unusual accommodation: the "Bubble room": a transparent, bubble-shaped cocoon. Various on-site activities: bouncy castle, concerts, sports tournaments,... Your holiday with us will be an unforgettable one! Lots of,activities. good,weather. friendly and helpful staff. 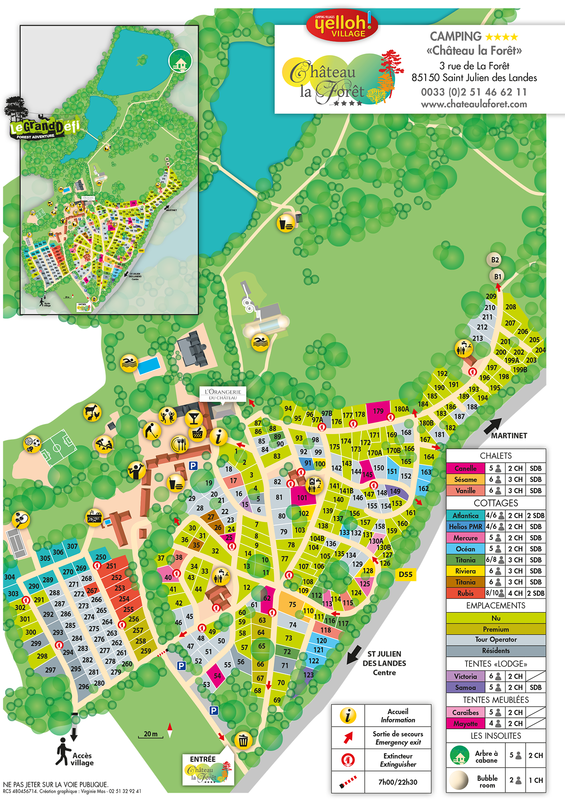 The 4 star camping Yelloh Village Château la Forêt in the Vendée offers high quality rentals for the whole family, so take your pick from our chalets, mobile homes and pitches. And you’ll also be able to enjoy a host of activities and facilities designed to meet each of your needs. Nestling in the heart of a tree-planted 50 hectare park, all those who love nature and the great outdoors will find an idyllic holiday destination perfect for recharging the batteries. On-site, the campsite is equipped with a complete aquatic area made up of a covered heated swimming pool with waterslides and paddling pool plus an unheated outdoor pool, reserved for adults. Everyone who enjoys sport will love having fun on the tree-climbing trails or playing paintball. And keen fishermen certainly won’t be disappointed either. They’ll be able to make the most of their rod and line on one of the private lakes, free of charge and measuring 2.6 hectares it is only open to campsite holidaymakers. The lake is stocked with pike and carp, so get ready to bait your hooks! Only catch and release fishing is allowed. Or why not saddle-up at the riding centre here in the château park? The ponies await your children from 2 years upwards, and horse rides are available for those over the age of 8. The 4 star campsite is ideally situated just 12km from the seaside and the beaches at Bretignolles-sur-Mer in the Vendée. So come and soak up the sun on the beaches of soft fine sand, or try your hand at the many watersports available. All those who love staying in quirky accommodation or unusual rental options will be in heaven here with us! Which will you choose, one or more nights in a tree-house to get really close to nature, or in a bubble room for an enchanting moment watching the stars with your significant other? Unbeatable for a romantic weekend. Since 2014 the campsite has offered accessible pitches and equipment adapted to those with reduced mobility (PRM). So, what can you expect to find here with us? Attractive and spacious accommodation with sufficient width and designed to meet your needs, an adapted bathroom with an INVACARE chair and a well laid-out living room that makes wheelchair access easy.